The best way to see the city is with a hop-on-hop-off bus tour! Your bus tour includes spots along the way at all the major attractions for you to get off and explore at your leisure. Complete your NYC sightseeing experience with an upgrade to include a ticket to the Statue of Liberty and Ellis Island. Choose the 48-hour bus option to include a hop-on-hop-off boat ticket that will provide amazing skyline views from the water and a spectacular double decker bus night tour. Whether you're a first time or repeat visitor, the New York Hop-on Hop-off bus tour offers unlimited value. 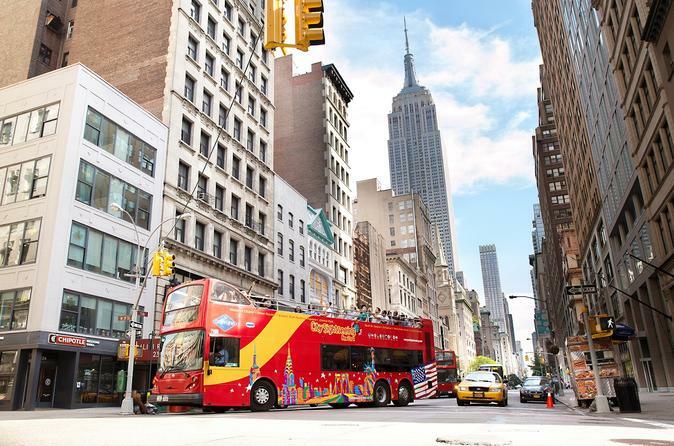 Discover the best of New York City sightseeing with your downtown loop bus tour. Upgrade to the 48-hour option to include 3 loops highlighting the most iconic attractions in the city: Times Square, Central Park One World Observatory, Empire State building just to name a few. You can hop-off at more than 50+ stops along these routes located near top attractions. Your ticket also includes a double decker bus night tour of the city (not a hop-on-hop-off tour) and a hop-on-hop-off ferry to see the city from the water.